Based on Barasui's manga series, Ichigo Mashimaro follows the life of Nobue Itou, her younger sister Chika, and her friends. The basic premise of the show can be summed up in "cute girls do cute things in cute ways", be it trying to quit smoking, going outside to play, celebrating a holiday, or doing school work. This OVA picks up where the series left off, continuing the adventures of your everyday life, only cuter. 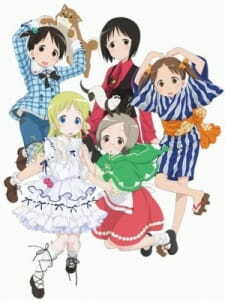 Ichigo Mashimaro OVA is indeed a continuation of &quot;cute girls do cute things in cute ways&quot;. The only differences from the original 12 episode series is, this one only has 3 episodes and it has a new OP and ED theme added to it. As you may know from the original series, their fun and adventures of their daily lives continues on by 4 adorable 3rd graders and 1 big carefree sister. As a group, they continue to entertainment themselves from the activities they do and the things they say on a day to day basis and for us, its joyful entertainment while we are being amused by their vivid imagination and events in which they occur. No doubt, this series could easily turn out into another 12 episode series where more fun and games can be introduced into their daily lives. As long as they keep the activities different, I don't see how it will fail. In conclusion, a good way to finish up the whole series in general. While there no real ending, you just can't help but imagine what new adventures they are up to next. The Ichigo Mahimaro OVAs basically continues the saga from the series of the same name, its extends the running time a bit longer this time around, which helps considering this is only a 3 episode OVA. We once again re-join the story about 4 grade school girls and their layed back older sister!The same good stuff from the series, it remains overall plot-less (as usual) and just has the girls continuing their day to day lives, with crazy antics and situations to follow them. I actually found it to be a bit more funny than the series was, as they seem to have polished the humor in it. Nothing very deep by any means, but quite fun to watch! There is no real ending to it on episode 3, as you could pretty much mix all the episodes up with each other and it wouldn't make any difference. You could even watch these OVAs before the series itself, since the only major thing that actually happens different there is they meet Ana. (a fellow cast member) Still, the girls always keep their day to day antics funny and interesting. Depending on your taste though, the whole "day to day" lives can be a great positive, or a big negative! If your a fan of a more "layed back" genera, then you will find that this title does indeed do it right, as the comedy bits come at the appropriate time and don't arrive as an overkill! The artwork has been tweaked from the series as well, and this time comes off a bit more sharp, and the backgrounds are better detailed. Not the best looking series by any means, but it does polish things up from the more blander texture found in the series. Still quite colorful and cute (especially cute). New opening and closing (party stlye) themes have been added, all sung by the cast themselves! Some scenes are remakes from the series opening too, both are quite fun and memorable to watch. Though I personally felt the original opening theme was a bit more lively to look at. The background music is pretty sparse over all, and most of the time has little to no soundtrack at all, though they did add a bit more music cues. It does help to increase the calm mood they were going for though, just don't expect to be "wow-ed" by the background beats that are there. Same lovable cast from before, cute and lovable that you just want to give each one a hug! This time I felt it wasn't left soly on Miu to hold the show together, as each girl acted a bit more comical than before. Still, if it wasn't for Miu this series wouldn't be nearly as funny, as the others remain more down to earth than her. But each girl is likable, though we never get any real back story or depth to them. They do compliment and interact with eachother very well, so you never feel that one is out of place with the other. Ichigo Mashimaro stays true to its "everyday life" formula, but manages to stick out amongst the rest from this style, as all the girls antics remain different and fresh throughout. For slice of life fans like myself, Ichigo is one of the best titles out there! It certainly won't win everyone over, and isn't going anywhere with its over all story. (honestly, they could probably go on and on forever with this series) But its a nice warm hearted tale that fills you up with warmth and happiness! I recommend it to the "slice of life fans," or to people who are looking for something comforting and lite to watch after a bad day! Can't say much that I haven't already said in my Ichigo Mashimaro review to be honest, so this one will be pretty short. Stories in this one were along the same lines, but had even less drive to them than the other series. Not a real big deal, it's SoL so it really doesn't need a knockout storyline. Still, some of the previous series' ones like Nobue getting a job were pretty funny and fresh, with only 3 episodes to make you'd think they could do more of that. Art's the same as before, pretty good and consistent. Girls are animated well and the environments look pretty good too. Same characters, delivering the same style dialogue. Not much to say here, it's the same as the regular series. Feels like going from Lord of the Rings to The Hobbit, not really a big disconnect here. It was fun to watch! Obviously if you liked the other series you'll like this one since they are super similar. I was HOPING that some of the uncomfortable stuff involving the little girls would be nixed, but it wasn't. Too many close cutoff shots of the girls wearing too little clothing or whatever, and of course Nobue being her creepy self with Ana and Matsuri *eye roll*. Overlooking all that, it was fun and cute.